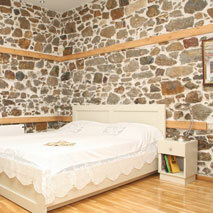 Why stay at Atzanos Traditional Houses? By choosing them you can be sure and proud of the fact that you are staying in one of the most rare and also most representative examples of heritage architecture on the island. While it is a stone building with a tiled roof, it also has “tsatmas” (the local architecture) decorating it and characteristic cantilevers on the spacious balcony which provides an uninterrupted view of the Aegean Sea, the whole amphitheatrical settlement and all the sights worth seeing in the village simultaneously. Each studio has its own distinctive style. On the ground floor of the heritage building of Atzanos Traditional Houses one can find the first independent residence. Built completely of stone, with the stone exposed, it has been decorated with much care and using wood as the main material. Fully renovated, it retains its character whilst offering all modern conveniences. It consists of one room, following the local custom, and a bathroom. A fully equipped wooden kitchen and a wooden double bed with a state of the art memory foam mattress (made of natural materials without springs) are included while the sofa in the living room area can be converted into a bed. The coolness of the stone walls is welcomely refreshing in the summer months whilst in the winter an environmentally friendly pellet stove, or, for whoever prefers them, heating radiators ensure warmth. The studio also offers a 37 inch, LCD television with satellite channels, internet access, a washing machine and tumble dryer, an iron, ironing board and a hairdryer. 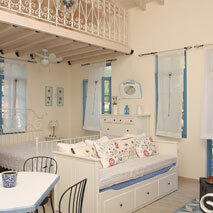 On the first floor of the heritage building of Atzanos Traditional Houses one can find the second independent residence. Fully renovated, stone-built with windows which afford views towards all directions, the occupant of this studio is given the impression of being in an open space, since it is actually possible to see the whole village from inside. The comfortable balcony offers the opportunity to unwind whilst enjoying the view of both the sea and the mountains, the tower, the church, the folk museum and the whole of amphitheatrical Chora. For those of you who do not want to spend time on the preparation of meals whilst on holiday we have taken care to provide breakfast and meals at two of the best establishments on the island.